Printmakers are welcome to respond to the philosophical, psychological, political, emotional and aesthetic dimensions of ideas surrounding infinity, paradox, illusion, post-modern diversity and instability. If it is true to say that many artists use art to better grasp reality or at least hint at its ineffability, then envisage and imagine and transcribe as printmakers your ideas concerning the complexity, difficulty and perhaps beauty that the play and struggle of nature/self/culture inevitably gives rise to. 10 printmakers will be short-listed as finalists in the first round and be given the opportunity to exhibit in a group exhibition during June/July 2019. In the second round, a winner will be chosen by a largely independent panel of judges(The Judges will choose a Winner based on the work displayed in the Group Show). 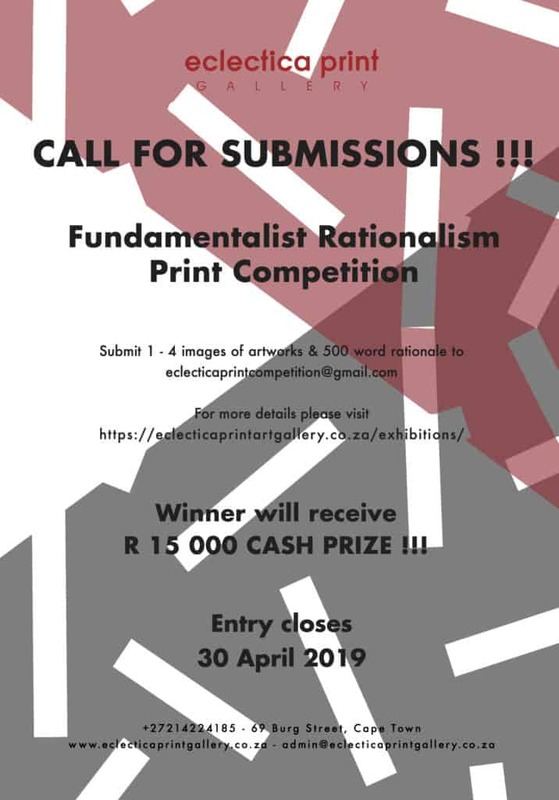 The winning artist will be awarded R15 000 in cash, a Solo Exhibition during November 2019 and representation by Eclectica. Date: Both Successful & Unsuccessful applicants will be notified by the 3rd of May. The entrance is open to all residing in Africa aged 18 and older and are not represented by a commercial gallery. Submitted works are to be completed X weeks prior to the closing date of the competition. Do not apply with works that have been exhibited or works that date before 2017.